On our third day in Southern California, we decided to take a morning and head down to San Diego and check out a few sights off the beaten path. We ended up hiking most of the length of Los Peñasquitos Canyon Preserve, which was a pleasantly quiet and nice canyon, considering that it’s nestled in between dense subdivisions to both the north and south. I still recommend it if you are looking for a nice urban-area hike. After our hike, however, we were a little hungry. We already had dinner plans back up in Temecula that involves copious amount of food and wine, so we were looking for something light. Luckily, I actually follow several other blogs that cover San Diego, including mmm-Yoso!!! (several contributors of which were my companions on the Yuma taco crawl a few years back) and A Radiused Corner (whose owner Dennis and I have been trading recommendations, and occasionally visiting the same places, for a few years now). 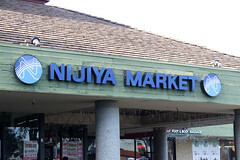 Both blogs recommended stopping by Nijiya Market, one of San Diego’s best Japanese grocery stores, as a good place for both Japanese groceries and light meals. 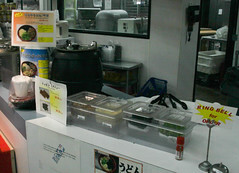 Especially since Nijiya Market has prepared food. The back wall of Nijiya, is almost entirely dedicated to prepared foods, and they’ve got a very healthy selection of various bento boxes, a tempura/fu-rai bar with all sorts of nicely cooked treats, a decent selection of pre-made sushi, and even a few noodle bowls and the like. And, nestled in amongst that, in a spot I wouldn’t have probably noticed without Dennis’ post, with little obvious signage I could see (a single 8.5×11 sheet of paper, although I later learned from Dennis’ write-up there’s a pretty big banner above it in Japanese), is a small counter for ordering bowls of fresh udon noodles. You ring the bell, a clerk comes over, and you order your bowls (plain, or with a few items like mountain vegetable being options). He shortly comes back with your bowl of freshly cooked noodles and a separate bowl of dashi. You can then pile on as much wakame, katsuobushi, negi, and tenkasu as you’d like. They then pack it all up for you to take the the register. The cost? A mere $3.50. 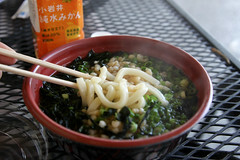 Grabbing a seat outside, I quickly poured the dashi over the noodles and sat back to enjoy the smell of a good dashi. The noodles themselves were quite delicious, with a good chewiness and that texture that’s unique to good udon noodles. The dashi was quite good as well, with a good “savory, but not salty” profile going on, and the various piles of wakame, negi, and tenkasu I added gave some nice flavor and texture to the dish as well (reminding myself now that I should grab a bag of tenkasu sometime to have around the house for my own soups). Really, this was just one of the better bowls of udon I’ve had, and one of the best in it’s price range. I’d get this all the time if I lived in the area (we usually have to make our own udon noodles when the crave hits….). Overall, Nijiya Market was the perfect little spot: great noodles for a light meal, with a very good price. I’ll certainly want to come back on another trip. Wow. Deep fried curry bread. I like the sound of that.